Ahh, the Levellers, who doesn't remember the crusty rockers of the early '90s, one in spirit with the road protesters and new age travellers, the band that shamelessly took the sound of New Model Army's "Thunder & Consolation" album, the song 'Vagabonds' in particular, and ran with it. They most famously sang "there's only one way" and proved it, recording album after album with little difference between them at all. It will probably surprise people that they're still around and they have a new album out. They did drop fairly drastically from view around four or five years ago, when people got tired of their raggle-taggle gypsy sound, but they're still forging onwards without compromising. 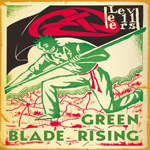 "Green Blade Rising" is just what it says on the tin, a Levellers album. If you expect something different, you'll be disappointed. This is the same free spirited rock balladeering with hoarse singing and loads of fiddle and acoustic guitar that they've been playing since they started. Admittedly, the fiddles do have a bit more of a trad Irish feel about them than before, giving the band more of a Waterboys feel than before, but that's about it. Technical advancements are kept to a minimum, there's the merest suspicion that there may be a drum machine in use at times, or a little bit of studio trickery on 'Falling from the tree' or 'A chorus line', but, really, it's another Levellers album pretty much like all the rest. If you feel you don't have enough Levellers albums already and haven't gotten enough of their sound, then this is for you. If you've never heard the Levellers before, but think you might like them, then I'd recommend you pick up 'Levelling the land' instead, it's better and you'll probably pick it up far cheaper, or, even better, NMA's "Thunder & Consolation". For the rest of the world, this is a harmless selection of tracks that's not likely to affect your view of the Levellers one way or another, though you might find yourself tapping your foot along to it now and again.